Here are some answers from 10 additional students’ first week‘s homework assignments for the Coursera Developing Your Musicianship class. Write in your own words the definition of harmony. Write in your own words the definition of ear training. Write in your own words the definition of interval. Identify three songs in the key of C major. Feel free to use a search engine like Google to find song titles. Write out the C major scale by hand. Here are answers to the first 5 reviews I got. I’m not including the comments I made to the students in this post though. Its already a bit long. 1. Write in your own words the definition of harmony. Harmony is the interaction of different notes across intervals, the quality of sound they make together. In particular, it involves notes that occur at the same time. Harmony is the study of melodies, scales, chords and chord progressions, which have an important relationship with the song key. Harmony means the chords, which go into a piece of music, and the traditions governing their use, during different era’s. It involves studying scales, as well as how to write melodic lines. The study of chords, scales and melodies. Study it well can make the music which you make become pleasing to the ear. To me harmony is a relation between notes that together define the base of the song during a specific time. Usually when I think of harmony is not just one note (like single voice melody) but instead the notes or chords that define specific moment in a song, the melody is also part of it. Knowing about harmony helps for example to know which notes I can confidently use in my instrument and which maybe I better avoid. I can use also harmony knowledge to add colors in specific moments, tension, etc. One example I could give is a song where the harmony is C major in a specific moment, in that scenario the bass could be playing the note C, the keyboard can play C major chord (C,E,G) or some of its notes, the guitar also the C chord or a few of its notes in a different register and the singer a C note or a note that belongs to the C major chord “harmony”. I think understanding harmony would allow me to know the “rules” or “options” I have at a given time to sound good with others. Harmony is the study about music relationships between melodies, scales, chords etc. How like-minded notes gather together as in tents called chords. What tents(chords) and what notes(melody) are allowed in what camps(scale). A tonal center could be termed the camp master. Chords, scales and melodies are studied by Harmony. Harmony also studies chord progressions and the key a song is in. What I noticed from this is that Professor Russell’s broad definition did confuse some people, and others went back to the definition that they understood from outside of the class, which has to deal with the sounding of multiple notes at the same time, or using notes/chord tones from the same scale. Its nice to see that other students stuck to what they know to answer this, like I did. Along with providing a score for each question, we have the option to include a comment as well. Under each comment field, a tracker lets us know how many words were written in our response. The 2nd video for Lesson 2 of Coursera’s Developing Your Musicianship class is a 2-minute review of Lesson 1. The video begins with 50 seconds of Professor Russel playing an original song on piano called “Something in C”. Naturally, its name comes from the fact that its in the key of C major. The Professor lets us know that that was the tonal center, or key the song was in. He promises more information about tonal centers and then moves on to a quick review of what was covered in Lesson 1. He then starts the actual review by asking how many students remember the C major scale and how its constructed, then plays part of that “whole-step, whole-step, half-step song”, which illustrates the intervallic construction of the major scale. 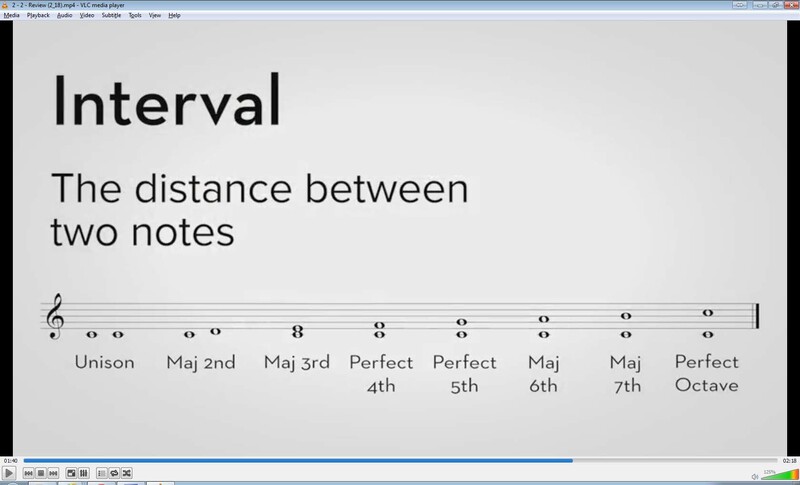 Next, he asks what an interval is, and onscreen, we see a definition (the distance between two notes) as well as a treble cleff that shows 8 intervals in the C major scale by name and with their music notation using whole notes. Video #9 is the last teaching video in Lesson 1 of Coursera’s Developing Your Musicianship class. In this one, Professor Russell takes about a minute and a half to discuss the first homework assignment and then plays that major scale song again. Harmony: the study of chords, scales, melodies and how we hear them when music is played. That doesn’t quite seem to be harmony to me. My understanding is that harmony is about notes being played together at the same time, and is mainly about chords. His definition seems to add in other items, like melody. The homework assignment is completed online. There’s a web page in which questions appear and can be answered, mainly through typing, although one question requires an image upload. I gave my definition of harmony in the answer box and added in my thoughts about the contrasting definition he provided. As the homework is peer-reviewed, I’ll have to see what other students in the class think about this. One interesting thing, to me, is that we have to each peer-review at least 5 other students’ assignments. We can do more if we’d like. I intend to do more, because I’m curious about what everyone else is writing, and I want to see what I can learn from it. Students who took other online Coursera classes said that they did the same and were able to learn more this way. Ok. Here are my thoughts about the 3rd video from Lesson 1 of Coursera’s Developing Your Musicianship online class. Here’s where the professor begins to tell us things. 1. Harmony: the study of chords, scales, melodies and how we hear them when music is played. I don’t know if this is right. When I’ve looked elsewhere, my understanding was that harmony had to do with multiple instruments or notes being played together at the same time, and that it was mainly concerned with sounds that blended well together (chords). Its supposed to be one of the most important things for a bassist to understand. Ok. Here are my thoughts about the 2nd video from Lesson 1 of Coursera’s Developing Your Musicianship online class. In this video, we see Prof. George Russel Jr. for the first time. He opens the video with a piano song for the first minute and 10 seconds and then introduces himself. We learn that he’s a professor of harmony and of piano at Berklee and that he started piano lessons when he was 7 years old. Initially, he learned classical music, but when he turned 11, he began playing gospel in church, which did not make use of written music. He said that these were two different camps and that he wasn’t able to meld the worlds together until he began studying jazz harmony in college, and later on in graduate school. He then continues with information about what to expect during the course. He says that topics covered will include the major scale, major triads, minor triads, major and dominant 7th chords, the minor pentatonic scale, ear training, harmony, the tonal center and intervals. That looks like a lot to me, so I have some hopes that I’ll get a good foundation in what’s to come, but I won’t really know for sure until later lessons. I’m happy to note that I’m actually familiar with most of the stuff listed so far, although by no means am I truly proficient. The professor goes on to say that having a keyboard is imperative, and that a piano is best. The website provides links to online keyboards for those who don’t have physical access to a real one. Then he recommends that students practice for 15 mins per day. This practice will include the major scale and triads and he says it doesn’t have to be fast. The main goal is to get the fingers accustomed to playing. I watched the videos for the Developing Your Musicianship course yesterday, and went through them a second time today. Altogether, the 10 videos total 41 minutes. Their usefulness to a beginner is uneven, in my opinion. Overall, I think they give people new to music an idea of what to study, but I didn’t find the videos consistently informative. They seem like a jumping-off point for further research, not a self-contained lesson. Its odd, but the more insightful comments came from the students and not the professor. Here are my thoughts on the first video. I’ll write about the others in subsequent posts. This is an interesting way to look at it to me, and it makes sense. Being able to hear notes, chords, identify progressions and so on do seem to make sense as a real-time application of theory, and denotes an understanding of what’s going on by virtue of recognizing what’s happening. Comprehending the significance of these things is probably dependent on knowing the reasons for using various note choices, silence, rhythms, techniques, or whatever, so its essentially understanding theory.